At the tender age of nineteen, I was living my life’s dream! I had emigrated from Colombia, South America, and was living in the United States of America with legal working status. But despite this achievement, I found myself defeated. I had no peace, no joy, and no vision for what my life could be. According to God’s Word, I was born again, holy and without blame, accepted in the beloved, and sealed with the holy spirit of promise (Ephesians 1:4-13); yet I was far from living these great realities in my life. Why? Because I was the epitome of what the Word says in Hosea 4:6: “My people are destroyed for lack of knowledge….” I was living without peace, power, or purpose in my life because I lacked the knowledge of the Father of all mercy, the God of all comfort. I did not know God was merciful and that His mercy was available to me—that is, until I sat through a life-changing Foundational Class taught by our wonderful Biblical research, teaching, and fellowship ministry. In that class I learned about God’s great mercy and love for me. As a result, I began to live a rich and full life in fellowship with God. No relationship in life is more satisfying and enriching than our personal relationship with our heavenly Father. One powerful and necessary element in our personal fellowship with God is His rich mercy. We will see what mercy is, why we need it, and how to trust in our merciful God. We will also spend some time looking at the life of the Apostle Peter and his great example of spiritual growth as he trusted in God, Who is rich in mercy. First, we must understand what God’s mercy is. God’s mercy is merited judgment withheld. It is tender compassion where severity is expected or deserved. 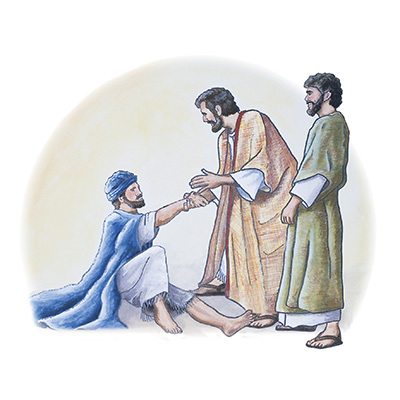 Mercy assumes need on the part of the person who receives it, and it assumes resources adequate to meet the need on the part of the one who shows it. Let’s see this great reality of God’s mercy from the Word. God is full of compassion, good to all, and slow to anger. The Hebrew words for “slow to anger” are also translated “longsuffering.” By His tender mercies God shows us His great love, compassion, and care. I get so blessed to see the tenderness and compassion my husband extends to our children as he faithfully teaches them the Word. At times when my patience is running low, he comes in with so much love and compassion that not only does it help the children get back on track, but it also helps me to remember God’s great mercy. The intense and compassionate love of a parent for a child is closely connected with mercy throughout the Bible. We have a merciful heavenly Father. Did you know that in II Corinthians 1:3, God is called “the Father of mercies”? Our heavenly Father is always ready to extend His mercy to us. God is plenteous in mercy and more ready to forgive us than we are to forgive ourselves. This verse states the same expression in two different ways, establishing the truth as unchangeable. God does not deal with us according to our sins. The same truth, that He does not reward us according to our iniquities, is also included. For as the heaven is high above the earth, so great is his mercy toward them that fear [respect] him. God even uses the distance of the heavens above the earth to communicate how great, how abundant, and how rich His mercy really is. Just think how high the heavens are above the earth. Pretty high, aren’t they? The mercies of God are not meager but rich and abundant. God goes to great lengths in His Word to communicate His abundant mercy. Some of the different ways this word “plenteous” is translated in the King James Version are “abundant,” “exceedingly,” “manifold,” and “many.” We can enjoy the many mercies of our exceedingly merciful God. When we love and respect God, we can count on His mercy daily because the Word says that His mercy is abundant and is also available to us every day of our lives. God’s goodness and mercy will be there for us all the days of our lives. With this great truth in our souls, we have the confidence to dwell in Him…. This is an excerpt from the November/December 2006 issue of The Way Magazine.